A Japanese cargo freighter launched Saturday on a five-day trek to the International Space Station, carrying a set of six replacement batteries, an experimental life support system, and a small new landing craft to bring specimens from the space station back to Earth. Built by Mitsubishi Heavy Industries under contract to the Japan Aerospace Exploration Agency, the H-2 Transfer Vehicle lifted off at 1752:27 GMT (1:52:27 p.m. EDT) Saturday after several delays spanning nearly two weeks caused by poor weather and a valve problem on the cargo ship’s H-2B launcher. But no such technical or weather issues came up during Saturday’s countdown, and the 186-foot-tall (56.6-meter) H-2B rocket fired its twin LE-7A first stage main engines and four solid rocket boosters to climb away from a launch pad at the Tanegashima Space Center in southwestern Japan. 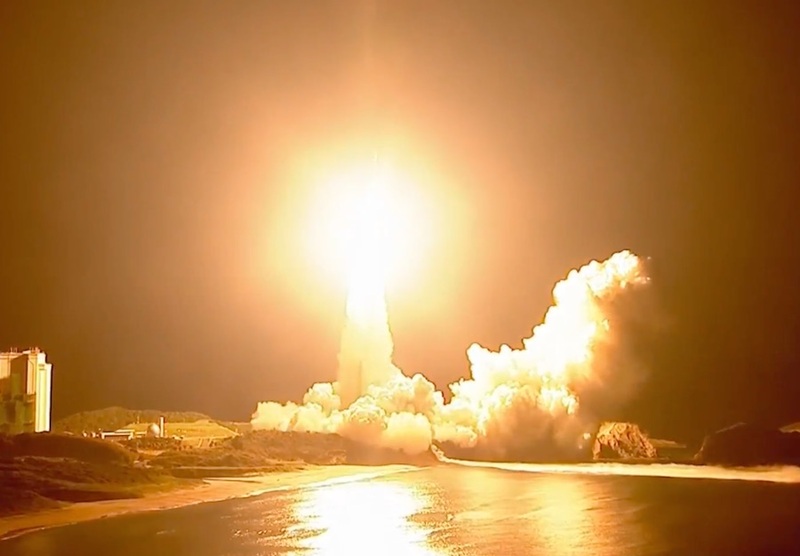 The H-2B rocket quickly shot into the night sky at Tanegashima, where liftoff occurred at 2:52 a.m. Sunday Japan Standard Time. The four strap-on boosters burned their pre-packed propellant and jettisoned from the H-2B’s core stage, covered in insulating orange foam, approximately two minutes into the flight. The LE-7A engines on the rocket’s first stage continued firing, and the launcher’s aerodynamic payload shroud jettisoned from the nose of the rocket to reveal the HTV resupply craft at around T+plus 3 minutes, 40 seconds, no longer needed after soaring into the tenuous upper atmosphere. A single LE-5B engine took over around six minutes after liftoff, firing more than eight minutes to maneuver the HTV supply ship into a preliminary orbit ranging nearly 200 miles above Earth aligned with the International Space Station’s ground track. 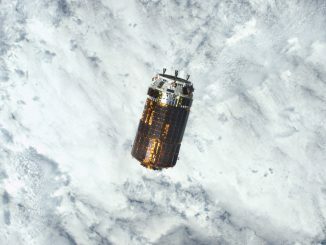 Japanese officials confirmed separation of the H-2 Transfer Vehicle around 15 minutes into the flight, and the cargo freighter was programmed to prime its thrusters soon after deploying from the H-2B launcher. The rocket thrusters will reshape the HTV’s orbit over the next few days, bringing it closer to the space station ahead of Thursday’s scheduled arrival at the international research complex. Astronauts Drew Feustel and Serena Auñón-Chancellor will use the station’s Canadian-built robotic arm to snare the approaching barrel-shaped HTV cargo craft around 1200 GMT (8 a.m. EDT) Thursday. The robot arm will then park the HTV on a berthing port on the station’s Harmony module, and astronauts will open hatches to begin unpacking the contents of its pressurized compartment. The HTV is loaded with more than 5.2 tons — more than 4.7 metric tons — of cargo. Among the logistics is 3,014 pounds (1,367 kilograms) of external equipment comprising six lithium-ion batteries and adapter plates. 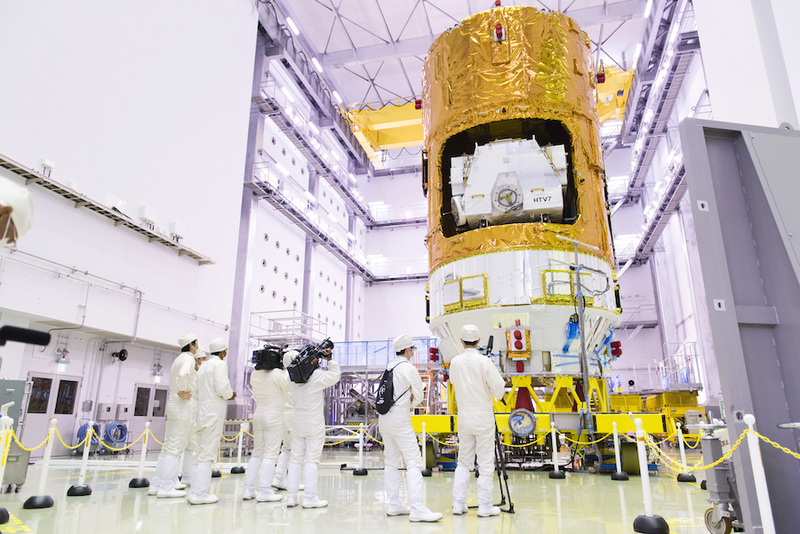 Inside the HTV’s pressurized cabin, workers loaded 7,489 pounds (3,397 kilograms) of cargo for JAXA, NASA, the European Space Agency and the Canadian Space Agency, including fresh food, crew provisions, scientific gear, computer equipment and spare parts. The HTV is the largest logistics vehicle currently flying to the International Space Station, capable of hauling heavier loads than Russian Progress freighters, SpaceX’s Dragon cargo spacecraft, and Northrop Grumman’s Cygnus supply carrier. Only one of the space station’s fleet of resupply vehicles — SpaceX’s Dragon capsule — can bring significant cargo back to Earth. Russia’s Soyuz spaceships can return a limited amount of equipment with space station crews, and the other spacecraft are designed to burn up in Earth’s atmosphere during re-entry. The Japanese space agency has developed a new return path for biological specimens to come back to Earth from the space station, and the re-entry capsule will debut later this year after the HTV departs the research outpost. The HTV is designed to burn up in the atmosphere during re-entry, but the small sample return capsule carries a heat shield to survive the trip back to Earth. The re-entry vehicle is relatively modest in size, measuring 33 inches (84 centimeters) in diameter and 26 inches (66 centimeters) in height, with a weight of less than 400 pounds (180 kilograms), excluding the sample carried inside. JAXA says the the capsule has an internal volume of about 30 liters, and astronauts could load up to 44 pounds (20 kilograms) of specimens inside the landing craft, which features a thermos-like container to store refrigerated biological samples. 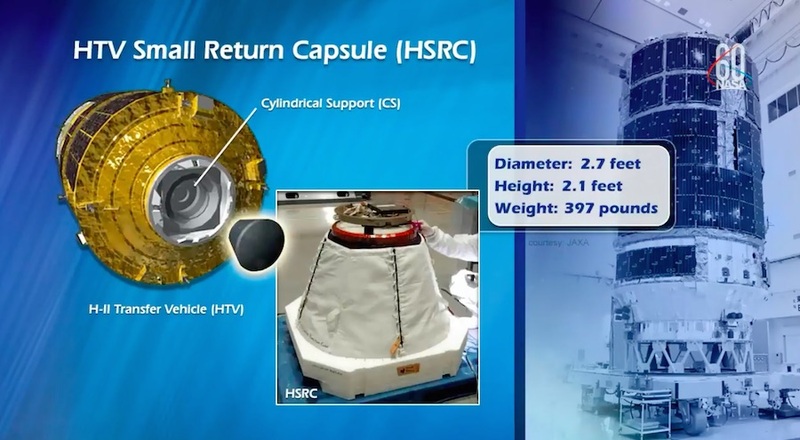 That is a fraction of the carrying capacity of the Dragon capsule, but the new HTV Small Return Capsule will offer station managers a new way to make sure time-critical items can return to Earth for analysis. Astronauts will assemble the return capsule after the HTV arrives at the station, and mount it into position over the HTV’s forward hatch for deployment once the supply ship leaves the station. The capsule, which carries no engines of its own, will jettison after the HTV completes its deorbit burn. The re-entry craft will deploy a parachute and splash down in the Pacific Ocean, where recovery teams will retrieve it and bring it back to Japan for inspections. The HTV’s unpressurized external payload bay carries six new lithium-ion batteries to be installed on the space station’s solar power truss, replacing aging nickel-hydrogen batteries used since solar array modules were launched in the 2000s. The space station has four huge solar power modules, each with solar wings spanning around 240 feet (73 meters) tip-to-tip. Each solar array section powers two electrical channels with 12 charging nickel-hydrogen batteries, and NASA is replacing the old batteries in power truss section with six lighter, more efficient lithium-ion batteries. 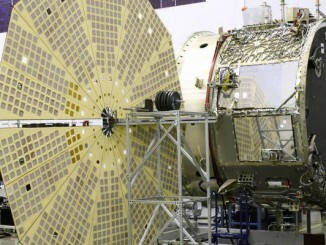 The first set of six new batteries launched on the most recent HTV mission in 2016, and two more HTV deliveries in 2019 and 2020 will finish the battery refresh. Astronauts will conduct two spacewalks to install two of the fresh batteries launched aboard the Kounotori 7 spacecraft, while the station’s robotics system will install the other four, all on the station’s port-side P4 truss segment. 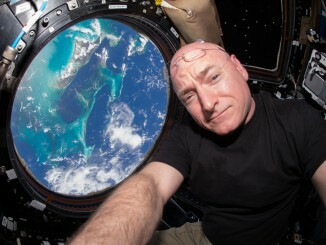 The two spacewalks were scheduled to occur before a planned crew rotation in early October, but the HTV launch delays forced NASA to postpone the excursions until later this year. Outgoing space station commander Drew Feustel, his NASA crewmate Ricky Arnold, and Russian cosmonaut Oleg Artemyev are set to return to Earth inside their Soyuz MS-08 spaceship Oct. 4. German-born European Space Agency astronaut Alexander Gerst will take command of the station crew upon Feustel’s departure, remaining on the orbiting complex with flight engineers Serena Auñón-Chancellor and Sergey Prokopyev. Russian cosmonaut Alexey Ovchinin and NASA astronaut Nick Hague are set for launch on a different Soyuz spacecraft Oct. 11, followed by arrival at the space station around six hours later to raise the lab’s crew complement to five. Feustel and Arnold were to join Gerst on the upcoming spacewalks, but their homecoming early next month has prompted a re-plan of the battery replacement work. Two refrigerator-size Express science racks will allow the station to host more research experiments. An experimental European advanced closed-loop life support system will demonstrate new air purification and oxygen-generation capabilities that could be used on future deep space missions. A new research facility called the Life Sciences Glovebox, built by JAXA in partnership with the Dutch firm Bradford Engineering, will allow astronauts to work with biological and human physiology experiment samples. Three Japanese CubeSats will be transferred into the space station from the HTV and released into orbit.